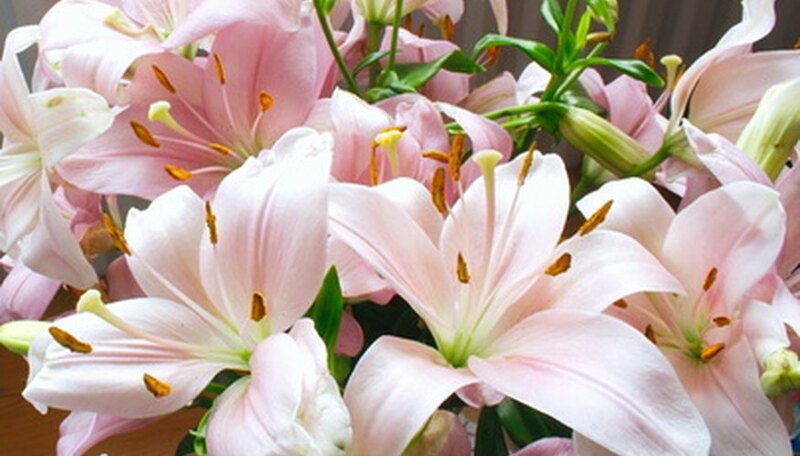 Oriental lilies produce masses of frilly, fancy, flowers that often times exude a heady fragrance. These attributes have made oriental lilies increasingly popular for planting, particularly in northern gardens where they are considered a favorite. Oriental lilies prefer temperate summer weather, good drainage and plenty of moisture. You can plant oriental lily bulbs in the spring, as soon as the ground is soft enough to work, or in the fall, from mid-September through mid-October. Choose a good area for planting the oriental lilies. The ideal area should provide plenty of morning sun followed by some afternoon shade for hotter southern climates, and in cooler northern climates between six and eight hours of sunshine a day. Break up the soil in the planting are using a fork, spade or pick to a depth of between 12 and 14 inches. Remove any garden litter or debris, such as rotting vegetation, sticks or rocks from the soil while you are breaking it up. Create a raised bed using organic matter if the soil in the planting area is heavy and clay-like. To accomplish this, incorporate into the soil an equal amount of decomposed leaves, coarse sand or aged manure. For sandy, fast-draining soil, incorporate about 1 cubic foot of decomposed leaves or dehydrated compost for every square yard of planting bed. Create planting holes that are between 2 and 4 inches deep if you are planting smaller-sized lily bulbs. For larger bulbs make each hole between 4 and 6 inches deep. Make sure each hole is wide enough to accommodate each lily bulb. For the best effect do as the University of Minnesota Extension suggests: plant the lily bulbs in groups of between three and five. Keep each planting hole about 8 to 12 inches apart, and each set of planting holes about 3 to 5 feet apart. Mix 1 tbsp. of bone meal into the soil in the bottom of every planting hole. Bone meal will help create promote a strong, healthy root system. Plant a lily bulb into a planting hole. Cover up each of the bulbs with between 2 and 6 inches of soil, depending on what size lily bulb you planted. Spread out over the planting bed a 4- to 6-inch layer of wood chips, grass clippings, aged leaves or similar material as a mulch to help protect the lily bulbs until they sprout. If you are planting lily bulbs in the fall, this is particularly important for regions that experience heavy frost. For fall planting of lily bulbs, make sure you remove the mulch in the spring. Use care when removing the mulch so you will not damage the tender sprouts. As soon as sprouts emerge, fertilize the oriental lilies using a slow-release fertilizer such as 5-10-10. Read the instructions on the label as to the spread rate, because spread rates can vary by manufacturer.